Ortuzar Projects is pleased to announce the opening of its inaugural exhibition, Michel Parmentier: Paintings & Works on Paper. 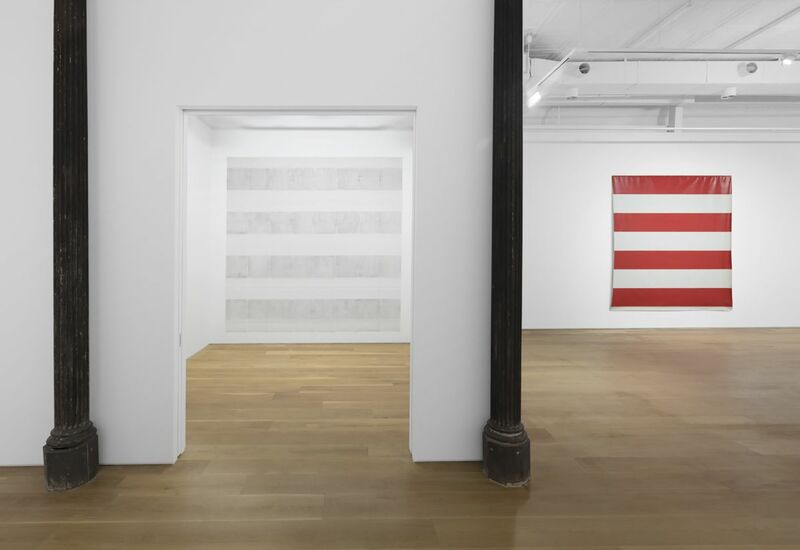 Featuring works produced between 1966 and 1993, this is Parmentier’s first solo show in the United States. Grounding his practice on a denial of gesture and narrative, Michel Parmentier (1938–2000) was an active and influential figure within the postwar critique on traditional modes of art-making. 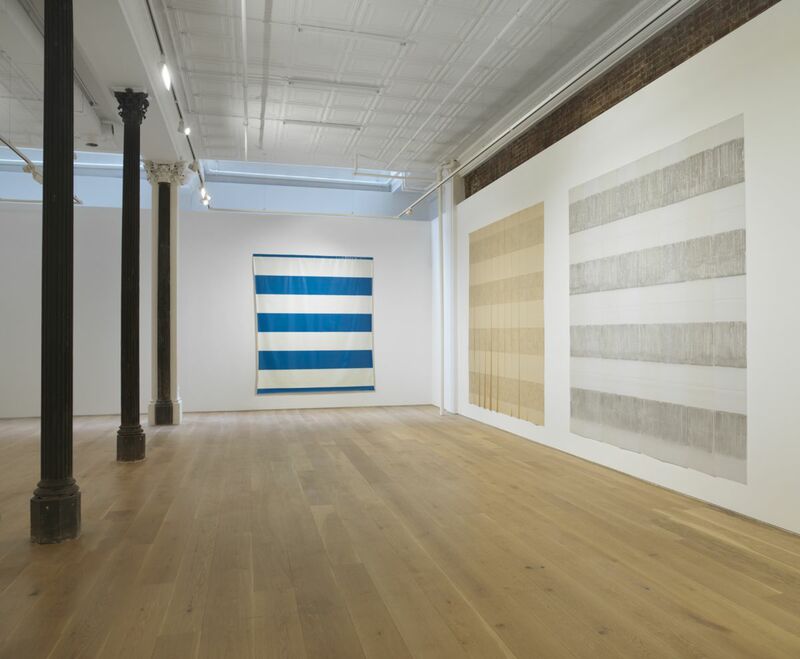 He is best known for the highly standardized, horizontally-striped canvases that he painted between 1965 and 1968. 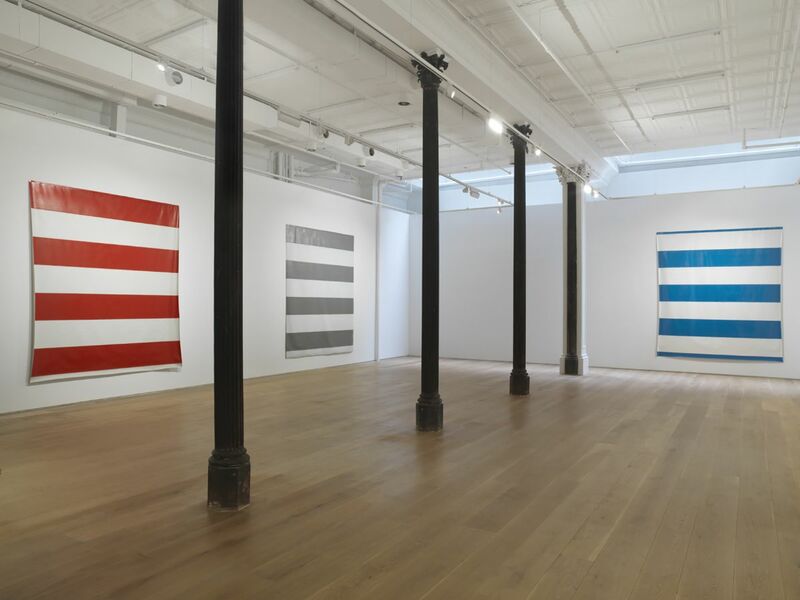 These works, produced through the pliage technique of folding the ground before the color is applied, are comprised of perfectly even, 38-centimeter bands which Parmentier varied in color annually (blue in 1966, gray in 1967, red in 1968 and black after 1983). In January 1967, Parmentier formalized his attack on painterly subjectivity when he co-founded the group subsequently known as ‘BMPT’ with Daniel Buren, Olivier Mosset and Niele Toroni. Fusing minimalism and institutional critique, Buren, Mosset, Parmentier and Toroni interrogated what they collectively considered to be bourgeois artistic sensibility in a series of four painting-performance ‘manifestations’. Parmentier broke from this collective in December 1967 and, in August 1968, from painting altogether. His practice remained dormant until 1983, when he resumed with a series of black paintings. By 1986, Parmentier had turned his focus to large-scale, freehand work on paper. Utilizing graphite, charcoal, pastel and oil stick, this body of work broadened his practice while remaining committed to the same motivations that had fueled his career in the 1960s. Michel Parmentier studied at the École des Métiers d'Art and both lived and worked in Paris, France. He is represented in the permanent collections of the Museum of Modern Art, New York; Centre Pompidou, Musée National d’Art Moderne, Paris; Musée d’Art Moderne de la Ville de Paris; FRAC Bretagne, Rennes; Musée des Beaux-Arts de Nantes; Fondation La Caixa, Spain; and the François Pinault Collection, Paris. Parmentier was the subject of major retrospectives at the Centre National des Arts Plastiques, Paris (1988) and Villa Tamaris Centre d’art, La Seyne-sur-Mer (2014). A select number of works in the exhibition will subsequently travel to the Eli and Edythe Broad Art Museum at Michigan State University for Parmentier’s first US institutional retrospective. The exhibition will be on view from April 28 to September 9, 2018, and will be accompanied by the English translation of an expanded edition of Michel Parmentier, Décembre 1965 – 20 Novembre 1999 – Une rétrospective (ed. Guy Massaux), co-published by Ales Ortuzar and Éditions Loevenbruck, Paris. Pastel gris (clair) appliqué à plat, verticalement, sur papier-calque, 7 bandes horizontales alternées de 38 cm de largeur (4+3) et, en haut et en bas, 2 bandes partielles vierges de 19 cm. Pastel gris (foncé) appliqué à plat, verticalement, sur papier-calque, 7 bandes horizontales alternées de 38 cm de largeur (4+3) et, en haut et en bas, 2 bandes partielles vierges de 19 cm.